Maintaining a diversified core is an important part of any global portfolio. It has the potential to reduce volatility and provide greater potential for positive returns. More recently, investors are seeing the additive benefits of combining broadly diversified global strategies with more focused or concentrated investment solutions. A concentrated portfolio can be defined as an investment solution comprised of 45 holdings or less. Canadian institutional investors have been allocating between 20% and 30% of total active equity to concentrated portfolios, with more than half stating they plan to increase that exposure over the next 24 months. Managers of concentrated portfolios, like many other investment solutions, maintain a greater weight in securities where they have the highest conviction levels. The main difference is that concentrated managers stay focused on only their highest conviction ideas within their specific “circle of competence”, avoiding securities that don’t meet that criteria. 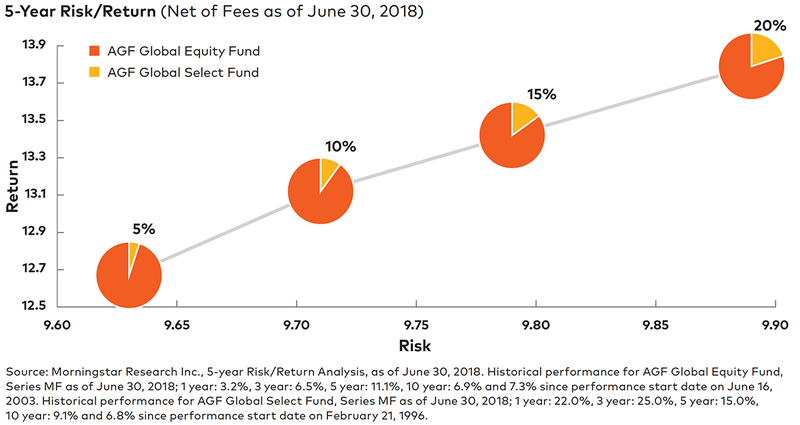 A 10-year study conducted at the end of 2009 reviewed the returns of over 4,700 mutual funds in the U.S., stripping out the managers’ “best ideas” (highest weight holdings), and compared that return against the funds’ average and their benchmark. A key finding was that a portfolio concentrated on each managers’ top 30 ideas outperformed the fund it was derived from, as well as the corresponding index. Another interesting finding was that more than two thirds of the best ideas were considered as such by only one manager at a time, and fewer than 20% were held by two managers. This suggests that views regarding stock selection are largely independent across managers. By adding a more concentrated portfolio to an already diversified core, you increase the potential for greater returns without significantly increasing risk. Taking AGF Global Equity Fund – a broadly diversified global equity fund – and combining it with AGF Global Select Fund – a more concentrated global solution – provides investors with a good risk/return strategy that can be modified depending on the individual investor’s risk threshold. The All World Tax Advantage Group is a mutual fund corporation that currently offers approximately 20 different classes of securities. In addition to fund diversification by investment style, geography and market capitalization, a key benefit of investing in any of the classes within the group is the possibility of sharing incurred expenses (and losses) of the combined structure potentially offsetting income earnings to minimize the chance of a dividend declaration. For a more detailed explanation, please see AGF.com/disclaimers. © 2018 Morningstar. All Rights Reserved. The information, data, analyses and opinions contained herein (1) include the confidential and proprietary information of Morningstar, (2) may include, or be derived from, account information provided by your financial advisor which cannot be verified by Morningstar, (3) may not be copied or redistributed, (4) do not constitute investment advice offered by Morningstar, (5) are provided solely for informational purposes and therefore are not an offer to buy or sell a security, and (6) are not warranted to be correct, complete or accurate. Except as otherwise required by law, Morningstar shall not be responsible for any trading decisions, damages or other losses resulting from, or related to, this information, data, analyses or opinions or their use. This report is supplemental sales literature. If applicable it must be preceded or accompanied by a prospectus, or equivalent, and disclosure statement.